Growing up I remember a friend telling me that they went to this restaurant every weekend and she could never say spaghetti. When she ordered her dinner she would say P'sghetti...they soon changed the name of the Spaghetti on their menu to P'sghetti. Every kid loves spaghetti, and Italian blood kids...well they just are given it in a bottle from the time they are born. Well, maybe not that early but as soon as they can eat solids I think it is given. Bennett is an eater, which is pretty funny because he only takes about 4 oz in his bottle before he calls it quits. When food was introduced to him he took off. 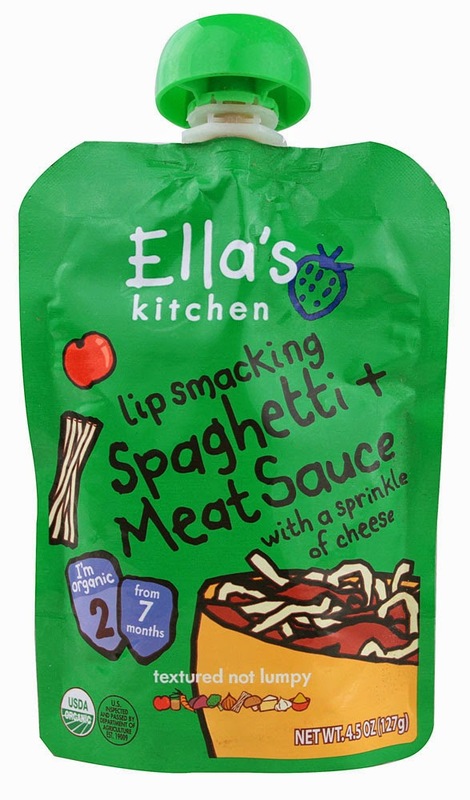 There isn't anything this boy won't eat...that is except Ella's Spaghetti Pouches. When I saw this in the store I grabbed and figured we would give it a try...much to our families dismay he hated it. I tried everything to get him to eat it, but he just didn't like it. I thought maybe it was because it had seasonings, so I made a chicken casserole for him and he ate that right up. I thought "this may be the end of Italian eating in this family"...but then I got an idea. I decided I would make Bennett my own sauce and maybe he would like it. I mean think of Chef Boyardee Vs. your Grandma's sauce. No Comparison. I have made simple sauces before, so I figured it couldn't be that hard. I used fresh Campari tomatoes, instead of can (hate can everything)...and cooked up a chicken breast while the sauce was simmering. Below is the recipe I used, feel free to add in peppers--onions--beef. The list is endless. Put 1 1/2 cups of water on to boil. Once boiling put the tomatoes in for a couple minutes (2-3) minutes. Remove them carefully with a slotted spoon. Remove the skin (it should peel right off). Place in food processor to puree. Once pureed, place back in the pan with water. Let simmer for 30 minutes, then add pureed chicken. You can leave to simmer longer--or serve then. 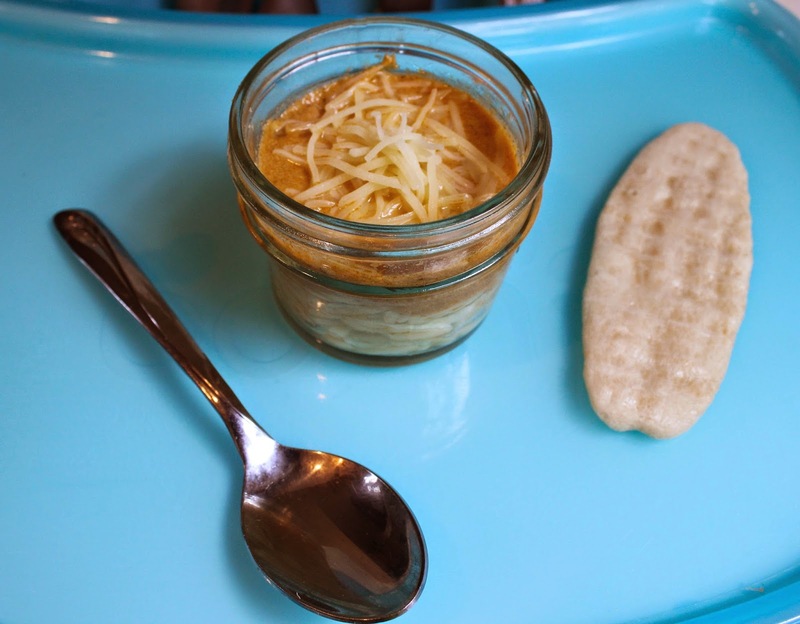 Serve with pasta and a sprinkle of cheese--we used orzo. Freeze the remaining in ice cube trays. 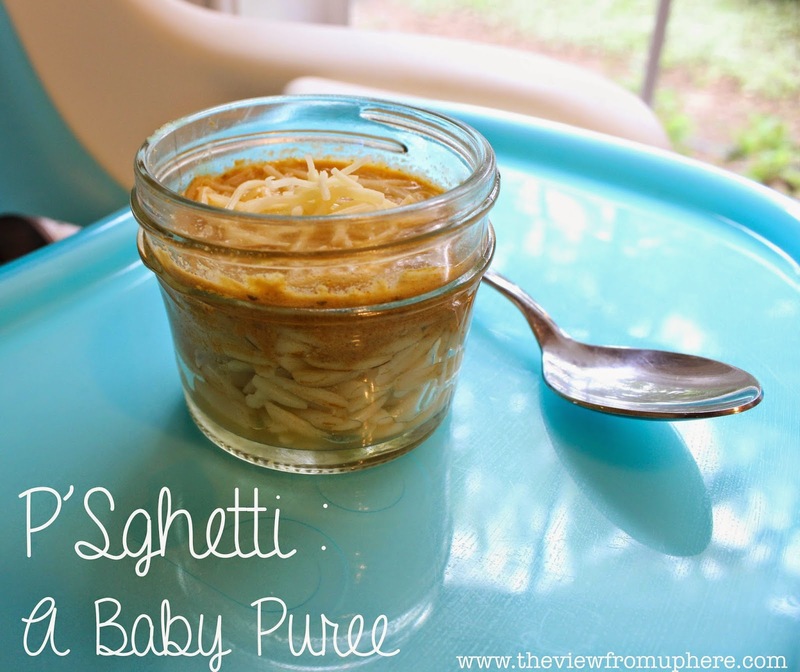 We would buy a can of Spaghetti-O's and puree it for our girls. Not as natural, but super-easy to do! I love this- we have a 10 month old and we've always made her food. It's so easy and saves us money. I could never justify spending extra money on specific foods for her when she eats everything that we eat. It sounds like you're setting up your adorable son for a lifetime of healthy eating! Great idea! Thanks for sharing at Waiting on...Wednesday!